In 1925 a novel by the famous surrealist author Franz Kafka was published. This novel was called "The Trial" and since then it has been considered to be among his greatest works. In 1962, once again Orson Welles adapted a famous literary masterpiece into a film. In a interview Orson Welles claimed that The Trial was his greatest movie. 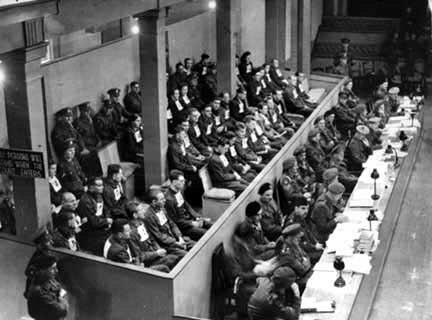 Sadly, The Trial was watched by a very few amount of people. Now, the movie is in public domain. It's very difficult to find since it's never had a official home video release. This movie stars Anthony Perkins, who later claimed that his greatest pride was being able to work in a Orson Welles movie. There's something bizarre going on. Josef K. notices this one morning when he is awakened by two police officers in his small but cozy apartment. The two officers of the law refuses to tell him what his charges are and why he is being arrested. The cops then leave, and Josef K. goes to his office where he is told off by his superior officers for having had sexual relations with his teenage cousin. After, Josef K. goes to the opera where he is arrested by an officer. This officer takes Josef K. to the court where he witnesses another man in the same predicament as Josef K. being punished in federal court. After, Josef K. meets up with his uncle who hires a lawyer to defend Josef K. The lawyer's mistress suggests that Josef K. should go visit Titorelli, a man who paints portraits of the judges in court. He feels Titorelli can put in a good word for Josef K. However, this is proved unhelpful. Then one day, Josef is apprehended by the cops once more. They take for a long trek into the desert where they throw him into a pit. SPOILER AHEAD! The cops then leave Josef as he laughs hysterically as a stick of dynamite explodes under him. The Good: Orson Welles' movie is a quality adaptation. I very much enjoyed the manner in which it was shot. It used shadows to tell the story. Much like the last Orson Welles' movie I reviewed, Othello, The Trial's most memorable moments are due to the cinematography. It's clear that the cinematographer Edmond Richard is a treasure. He worked with Orson Welles again in Chimes at Midnight. After that, it seemed Luis Bunuel took notice of him and used him in two of his movie. After that, Edmond Richard did not do any major films. It's tragic such a great cinematographer goes unnoticed. Most of the time when somebody adapts a novel into a movie, they read the book and usually take most of the same dialogue, especially in older movies. Orson Welles did indeed take some dialogue from the novel however the order this takes place in differs greatly from the book. The order that the chapters take place in in the movie is 1,4,2,5,6,3,8,7,9,10. Also, I liked the metaphor that was used at the start of the film. It felt as though it echoed out and surrounded the rest of movie. I won't spoil this quick sequence in the opening of the movie, since it was a delightful moment that made this movie more likable. The Bad: Recently, the movie Cloud Atlas was released. I remember I once went on Rotten Tomatoes and it said the critical consensus was 'a beautiful mess'. Perhaps the word 'beautiful' doesn't best represent The Trial, but the word 'mess' definitely does. The Trial is a cinematic mess. Don't get me wrong, I understand that this is surrealism but I have an odd feeling the Orson Welles does not have Kafka's genius within him. Kafka could make his stories naturally bizarre. Orson Welles had to try to live up to the scattered mind of Franz Kafka, and you can tell there is something of a difference between their ideas. What I am trying to say is, unlike the novel "The Trial", Orson Welles' movie does not flow as nicely.